Yes, some insects are pests. But they also pollinate plants. OXFORD, Pa. – A staple of summer – swarms of bugs – seems to be a thing of the past. And that’s got scientists worried. Pesky mosquitoes, disease-carrying ticks, crop-munching aphids and cockroaches are doing just fine. 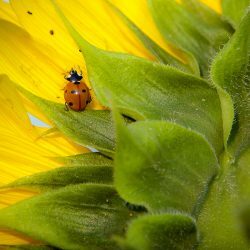 But the more beneficial flying insects of summer – native bees, moths, butterflies, ladybugs, lovebugs, mayflies and fireflies – appear to be less abundant. University of Maryland entomology researcher Lisa Kuder says the usual close-crop “turf is basically like a desert” that doesn’t attract flying insects. She found an improvement – 70 different species and records for bees – in the areas where flowers are allowed to grow wild and natural alongside roads.